Any activation can also be carried out by post by sending in Your BCM or “Body” Computer. Wiring Requirements – some dash wiring looms already have the wiring in place for the cruise. The 2 wires required wiring run from the BCM to the squib connector near the ignition switch , remove the plastic cowling around the upper part of the steering column & look for a connector plug, if you’ve 2 orange wires ( 1 orange , 1 orange w/yellow tracer ) in position 4 & 5 of that connector you have the wiring needed. A video to help identify them is here . Usually if you find you have the cruise wires the other wiring for high spec clocks & most other optional extras is fitted also. If you need to fit the wires yourself, locate the ” squib connector” under steering column lower cowling, nearest IGN switch, you ‘ll see the connector has nothing in pin’s 4 & 5 & wires in all other 4 pins, (1,2,3 & 6). Squib Connector Pin 5 (scm signal) (original is orange) to bcm C6 pin 26 (speed control signal). 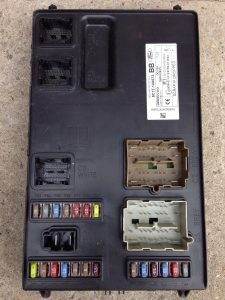 You’ll need to pull the tab on the side of the connector away slightly to be able to remove the cables but you should be able to push the 2 terminals straight in. On the BCM itself, it’s plug’s inputs are clearly marked C6, C5 etc, you only need to work on C6. unplug connector C6, lift flap at the side and slide out green connector, & you can then insert your 2 new wires. The 2 wires you create must be terminated with Ford tip’s & these must be harvested from a scrap loom, grab yourself a BCM connector from position 3, 4 or 6 with a few inches of wire tails from a scrap yard & you ‘ll have plenty as both ends of cruise wiring require the same tip. For high level clocks you need 3 wires from the indicator stalk connector to the connector plug at the back of the new clocks, this allows control of the high level clocks menu.. its an easy job with the right metal wiring connector ends, ideally donated from a scrap loom .the type & size of connector you need are used all over the dash loom.. a great wiring guide for cruise & other mods penned by Welsh Transit enthusiast “Loot” can be found here. 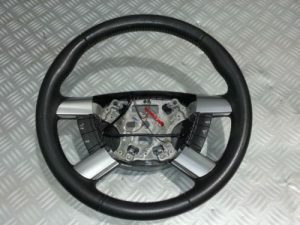 If you are looking for the steering wheel with cruise buttons , search also for C-Max 2003-2007 as part is compatible. With the trip computer indicator stalk, some Focus items are compatible also. Try Breakerlink for parts if you are stuck. For the simplest fit specifically use the wheel pictured – other Focus MK2 ones appear similar & can fit in some cases but can differ internally , the 2nd pic of one has its airbag removed. 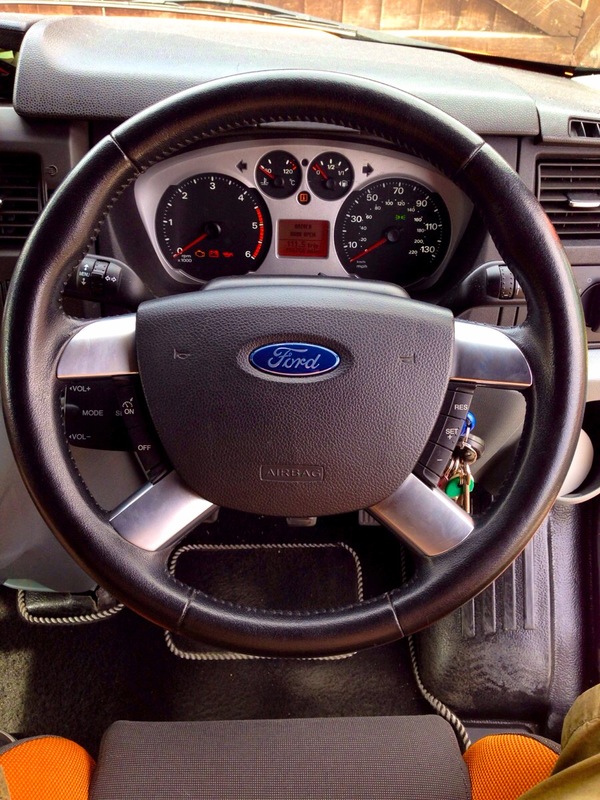 Carry out a steering angle sensor calibration ( with IDS) if you do fit a non transit one. Q- I just want cruise – what do I need ? Q- if you have a C or D series BCM ( body control module) already just fit the right steering wheel & book in for activation.. ( all van’s i have seen with C /D series BCM’s do not require any additional wiring) if you’ve a B series BCM, buy a used C or D series BCM, fit your wheel , fit if needed the 2 cruise control wires & book in for BCM fitting & activation.Bring any spare keys as all keys get cleared & re-added as part of the new BCM installation. Q- Can it be done by post ? A – Yes, in most cases, just send me your BCM..
Q-I’ve fitted trip computer clocks & the functions all work apart from the outside temp? A- A temperature sensor is needed & the function needs activating & that will only work on C or D series BCM’s. Many Mk7’s have the plug ( with a blanking plug fitted ) for the temp sensor near the off side fog lamp on the chassis leg – The sensor just plugs in there & is the same part on many mondeo’s also. To wire one in Pin 1 at Sensor (GN/BU) connects to BCM C4-33 / Pin 2 at sensor (YE/GN) connects to BCM C4-24. Q- Its activated but isn’t working? nothing happens on transits when you press ON, you have to press plus ( +) & then lamp will light & speed is held & can be adjusted up & down using +/- as normal. Over 1500 rpm & 3rd gear or higher approximately is the minimum speed required. Tried that & still not working ? There’s a clutch position switch (part number 1143409 for £15) which has to be functional, the switches themselves fail or the tang coming from the clutch pedal arm can bend, so not switching correctly. The tang when set correctly is at a right angle to its parent more or less . 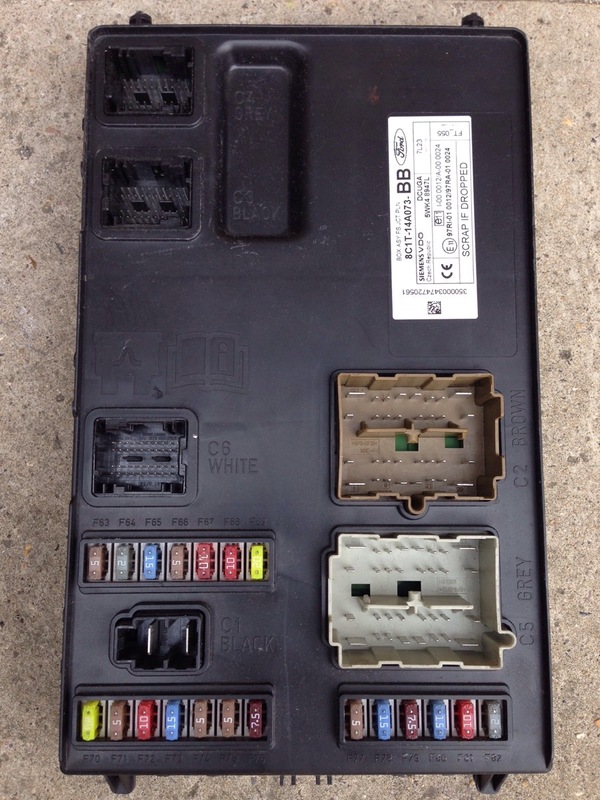 You can test the function of the switch with the FORD IDS diagnostic tool or similar in the datalogging section for the BCM where you can also monitor the cruise control ( buttons) function. Look for 200k ohm’s with an instant reduction if OFF, + or – are pressed. If you have that cruise is activated & the buttons are working. Q – The mileage in my new clocks is totally wrong, can you adjust / correct it ? A – Yes, up or down to match old clocks only , I don’t offer a wind back service ! Q- The clocks I have fitted seem to work on the trip computer side of things but they reset randomly? Q – I’m worried my VIN or Vehicle spec ID will change by fitting used parts ? A -Vantuners service modifies only whats needed so all ID & VIN numbers still match if Ford plug in all info spec & VIN etc is correct for the spec of van & module updates or replacements can be carried out as normal. Q- I am having trouble finding C/D series BCM ! A – I do have them from time to time otherwise try the Breakerlink used parts search utility for hard to find parts.